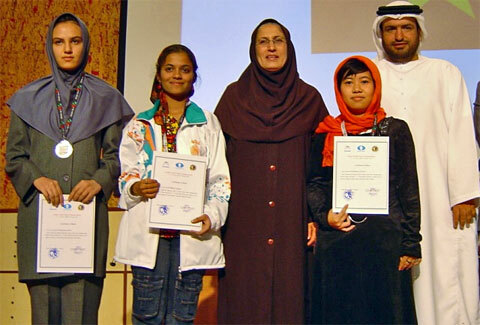 There is a very nice photo-report of the Asian Youth Championships held in Tehran, Iran. FM Arash Akbarinia is a frequent contributor to ChessBase and has filed a brief report with some very nice pictures. Focusing heavily on European events, these reports are always a welcome sight. It is the only way the universality of chess can be shown. Under-16 Boys: (L-R) Third place Ikrom Ilhomzade from Tajikstan, second place B. Adhiban from India and first place A.R. Saleh Salem from United Arab Emirates. Photo by FM Arash Akbarinia. Under-16 Girls: (L-R) Iranian Mitra Hejazipour, Vice-Champion, third place Kulkarni Bhakti from India and Vietnamese Hoang Thi Nhu Y, champion. Photo by FM Arash Akbarinia. India was the dominant contingent. According to a report on Chennai Online, they bagged 21 medals with six being gold. The boom in India is afoot. The conspicuous absence of the Chinese was strange. What I find interesting is that the youth tournament can give one an idea of which federations will become future powers. India’s name has definitely been near the top along with China. I would like to add the following four countries: the Philippines, Vietnam, Iran, Turkey. I’m not certain of the development of Central Asian nations such as Kazakhstan, Uzbekistan, Tajikistan, Turkmenistan and Kyrgyzstan. They are all former Soviet Republics and may have some traditional encouragement. What is interesting are countries included in the Asian tournament such as Lebanon and United Arab Emirates. Iraq and Iran are normally in the “Middle East”. Such a tournament would be a socio-cultural bonanza with a lot of different religions, culture and colorful traditions!! A chess renaissance is occurring in the Asian continent.